After making my 20-minute pumpkin butter, I knew it was destined for good things. First up, oats (! ), which you already saw if you follow me on Instagram. And if you don’t follow me there, like, why not? This recipe is all kinds of simple, requiring just 10 ingredients and 30 minutes to prepare. 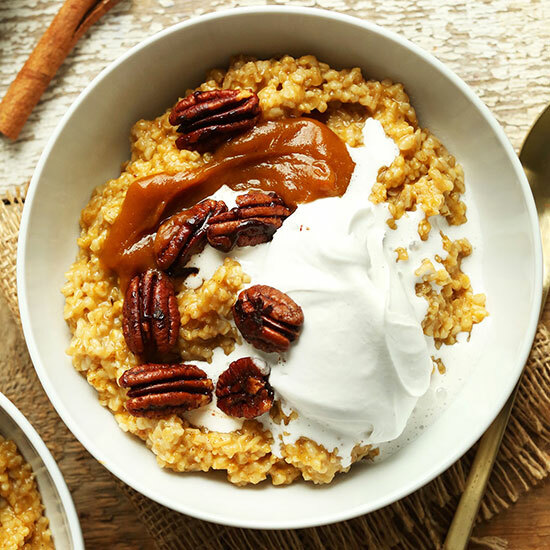 Steel cut oats make a fiber- and protein-rich base, pumpkin butter and pumpkin pie spice add autumnal flavor, and coconut sugar (or maple syrup) adds natural sweetness. That’s right – these PIE oats are naturally sweetened! It’s too good to be true. These oats would make the perfect breakfast this fall and winter. They scream fall and satisfy that pumpkin pie craving without all the crust (and guilt). If you try this recipe, let us know what you think! Leave a comment, rate it (once you’ve tried it), and tag a picture #minimalistbaker on Instagram! We love seeing what you come up with. Cheers, friends! 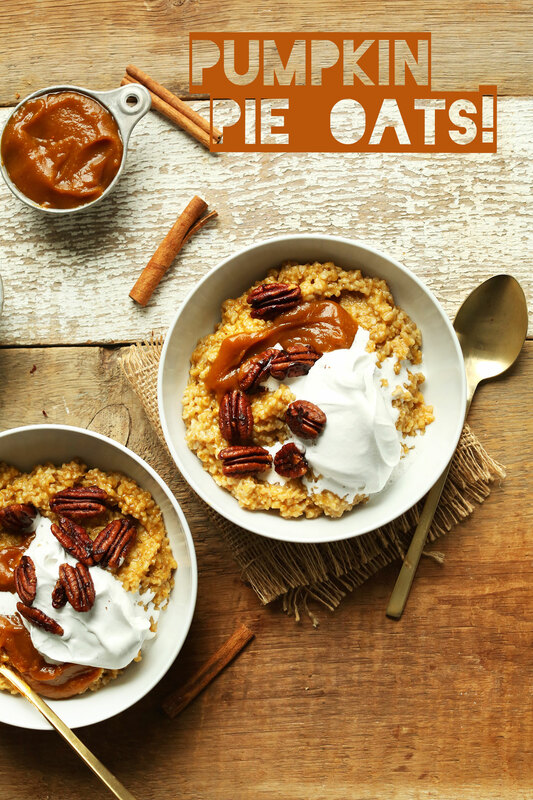 Naturally-sweetened pumpkin pie oats with pumpkin butter! Topped with coconut whipped cream and maple-cinnamon pecans for a fancy touch. Just 30 minutes and 10 ingredients required. Preheat oven to 350 degrees F (176 C) and arrange pecans on a foil-lined baking sheet. In the meantime, start your oats by bringing water or almond milk (almond milk will yield a creamier result) to a boil in a small saucepan. Once boiling, add a pinch of salt, then add oats. Swirl to coat. Then turn heat to low and cover. Simmer for 15-20 minutes or until the water is absorbed and the oats are tender. In the meantime, add pecans to preheated oven and toast for 5 minutes. While they’re baking, add melted coconut oil, coconut sugar, maple syrup, salt, and cinnamon to a small mixing bowl and whisk vigorously to combine. Remove pecans from oven and add directly to the oil-spice mixture. Toss to coat, then add back to baking sheet. Bake for another 5-7 minutes or until deep golden brown and fragrant. Remove from oven and set aside to cool. 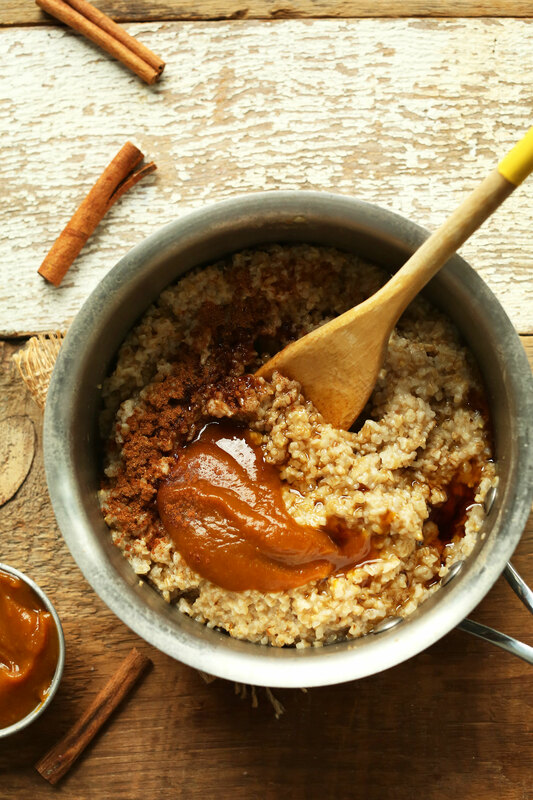 Once oats are finished cooking, remove from heat and add cinnamon, pumpkin pie spice, maple syrup (or coconut sugar), and pumpkin butter*. Stir to combine. Then taste and adjust seasonings as needed. I added more pumpkin butter and sweetener. 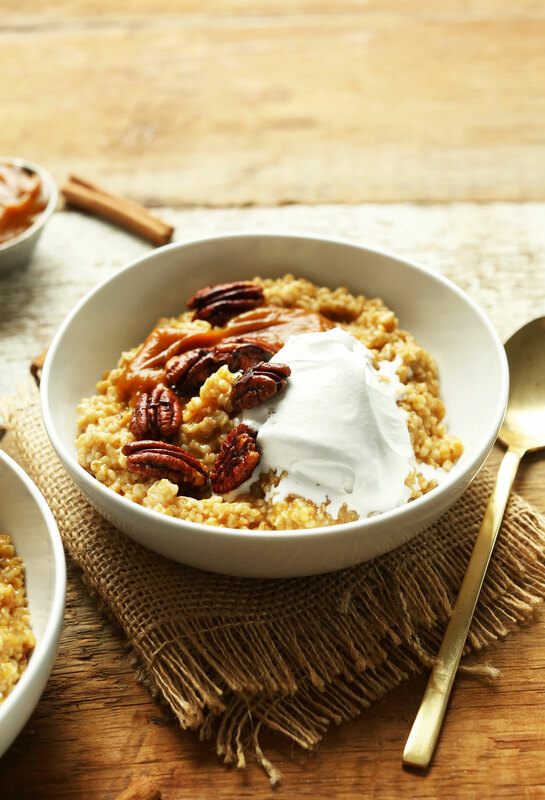 Divide oats between serving bowls and top with coconut whipped cream (optional), additional pumpkin butter (optional), and maple cinnamon pecans. Ground cinnamon makes a colorful garnish. Best when fresh. Store leftovers (separate) covered in the refrigerator for 2-3 days. Reheat in the microwave or in a small saucepan over medium heat until warm, adding more water or almond milk if too dry. *If using rolled oats instead of steel cut, follow instructions as written, however make these three changes: 1) reduce cooking time to 5-7 minutes (instead of 15-20), 2) only lower the heat to medium (instead of low) to cook more rapidly, and 3) instead of covering oats, leave uncovered and stir occasionally to prevent sticking. 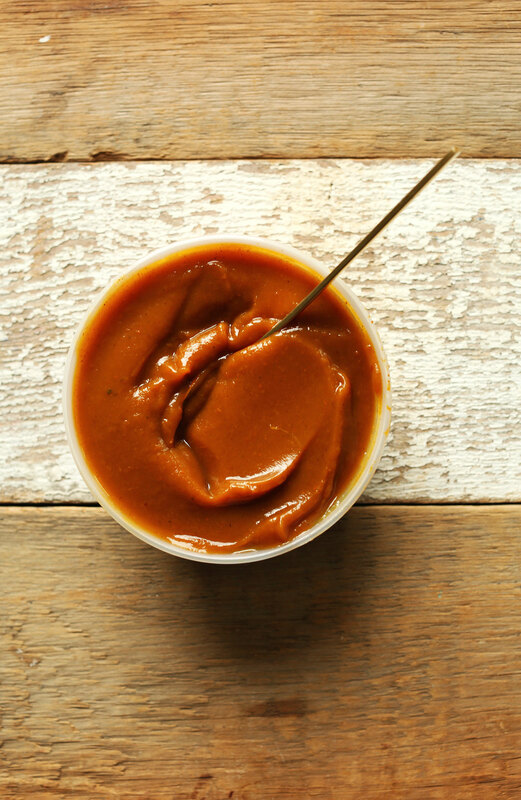 *If using pumpkin puree instead of pumpkin butter, simply add more pumpkin pie spice, cinnamon, and sweetener to taste! Use this recipe as a guide. *Nutrition information is a rough estimate calculated with pecans, but without coconut whipped cream or additional pumpkin butter. I was totally lazy and added 1/2 cup of Libby’s pumpkin puree….lots of pumpkin pie spices and maple syrup. I topped with chopped almonds and pumpkin seeds…no whip but next time…I used what i had it is was delicious…I wish I took a pic but we gobbled it up before I thought of it!! I just made this. Used regular oats but otherwise followed the recipe. They are to die for. Best fall morning treat. I wrote this down to make on Friday with the coconut whip. Lovely recipes. I am terrified to boil almond milk, anything to look out for when boiling- or a fave brand (for those that don’t make their own)? I always use water for oatmeal because of my fear.. So easy and yummy. Substituted walnuts for pecans. Absolutely loved this recipe! I added diced apples to the almond milk as I was heating it. The apples added a great bit of extra texture and flavor, and paired beautifully with the pumpkin butter. 10/10 for this recipe! I also tried that with chia seeds instead of oats for more protein- tasted really amazing! Thanks for the receipe!! Absolutely in love with these Pumpkin Pie Oats. It was like eating autumn in a bowl! I chose to cook my rolled oats in almond milk, which I’m super happy about because they were indeed creamier. The pumpkin butter was outstanding and the maple cinnamon pecans added perfect crunch and sweetness. Thanks so much for all of your amazing recipes, Dana! I’m obsessed with pretty much everything you post! This recipe is outstanding! It not only looks delicious, but it is too. Thank you for this innovative approach to steel-cut oats! I love the taste of pumpkin butter but I have felt a little stumped on what to do with it besides slathering it on toast. I’m so glad you’ve made some dishes using it. This recipe and your Pumpkin French Toast bake are going to be my go-tos as soon as I whip up a batch of pumpkin butter! Thanks for the great content! I have one more recipe using it coming up. Stay tuned! This was amazing!!! Easy to make, and smelled like fall while I was putting it together. Now one of my fall favs, thank you! I’m a huge fan of flavor-packed and nutritious oatmeal – one of the only things that keeps me full for most of the morning. Can’t wait to try this sweet & autumnal recipe! Clever and tasty breakfast! I knocked off a star because this was soooo sweet- maybe because the pumpkin butter I used was already too sweet? Next time I will only add a splash of maple syrup, rather than 2-3 tablespoons. I made this over the weekend and it did not disappoint. I used pumpkin puree so I added extra pumpkin pie spices and maple syrup (3 tbsp but I would cut back on this next time). This is definitely a decadent breakfast so I won’t be making it often but its great for when you want something really special! Looks fantastic! Warming and not to sweet. I might have to make this the night before and reheat, as we have a two-year-old around here who isn’t too patient about breakfast once he gets the notion. Ha! That might not go over too well, but it’s an excellent fall breakfast! Hope you love it, Charlie! This looks mouth-watering! Thank you. This looks lavish! Great idea and better yet result, I’ld love some as a second breakfast today! Yum! This looks absolutely delicious! I want pumpkin pie for breakfast, that’s for sure. Exactly what I need for the chilly fall mornings! Every Wedneaday we usually have baked oatmeal for breakfast. Looking forward to switching it up and adding this into the rotation. Happy to have come over from Instagram. Thanks Tyra! Hope you love this! What a yummy recipe! Oats are such a great food to eat and making them festive is so cool! With these chilly fall mornings, we’ve been eating lots of warm oatmeal for breakfast. This is such a wonderful recipe! I’m super intrigued by that pumpkin butter…can’t wait to try it! Oh myyyyy! I have a pumpkin pie oatmeal recipe in the making but you just topped it! LOL! This is such a lovely twist for oats! Thanks Dana, I love the simplicity of all your recipes, they’re awesome! I recently did your chocolate chia pudding and it was FABULOUS! Dana, I’ve been so impressed with your fresh approach to food and cooking up delicious recipes. I will most definitely try this recipe, I love pumpkin any time of the year and its sooo good for you! Thank You. Hi Anastasia! Yes, oats are naturally gluten-free, however, some facilities process oats and wheat products, so there could be gluten contamination in certain brands of oats. To be sure you’re eating 100% GF oats, make sure it says “gluten-free” on the package, I think Bob Red’s Mill sells that kind. Also, make sure to read the label, and if it says it was processed on a facility that also processes wheat, then there’s the risk of it not being GF. Random question for you: For awhile now whenever I go to your website it doesn’t show up as the homepage/most recent recipe. Instead it pulls up a stripped down version of the site (no real formatting) and is stuck on the recipe for tomato basil arancini. Any suggestions on how to fix this? Wish I could attach a screenshot for reference! 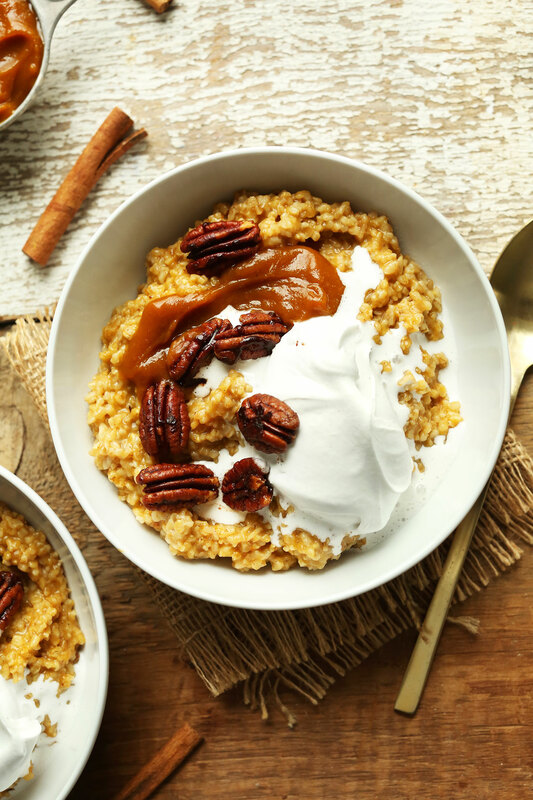 the maple cinnamon pecans and pumpkin butter take these oats to a whole new level, who wouldn’t want to eat this for breakfast everyday? Absolutely. I agree with ya! Pie for breakfast is my favorite. But it drops my blood sugar and then I get all sleepy and then wife gets cranky because I’m not motivated to do much. These oats really satisfy that “NEED” for pie without all the, um, crap. Thanks! Great minds think alike. I just recently prepared raw oat groats with pumpkin to share soon. This looks absolutely, positively, delicious!